We will make this into a supreme sundae kids cooking party by making cookie cups to put sundaes in. Once you know the number of children coming go through the list of things needed especially utensils, bowls, etc. 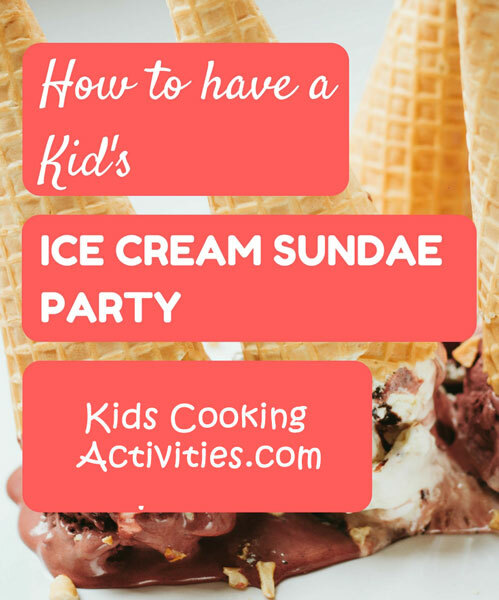 If you need extra ask friends or family if you can borrow some items for your sundae kids cooking party. Send out invitations. 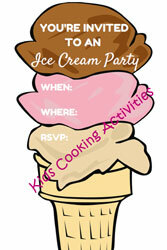 We have some to choose from including this ice cream party invite. Make a cookie cup out of store bought cookie dough or make the following cookie dough recipe. You can use any type of cookie recipe you would like. Here is our favorite. Work together as a team and assign different tasks to each child so everyone has a turn adding or stirring. In mixing bowl cream together butter, sugar, brown sugar, eggs and vanilla. Have kids take turns adding ingredients. Mix in a mixer or stir using a wooden spoon. Add in baking powder, baking soda, and flour giving each child the opportunity to add and stir. With a wooden spoon stir in chocolate chips. Grease each hole of a muffin pan. Press a small ball of dough into each muffin cup. Press cookie dough up along sides making a well in the middle. Bake at 350 degrees for 7-10 minutes until golden brown. Allow to cool. While cookie cups are baking prepare the table with sundae toppings, chocolate syrup, strawberry syrup, caramel syrup, ice cream scoop, crushed cookies, chopped nuts, plastic bowls and plastic spoons. When cookies are done, press down the middle of the cookie with a back of a spoon or ice cream scoop while they are still warm. Allow to cool and give each child a sundae cup and a scoop of ice cream. Let them put their own toppings on. 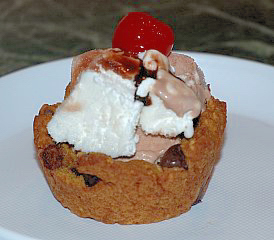 Try one of our Homemade Easy Ice Cream Recipes to go with your cookie cups. Obviously, if you are going to host an ice cream sundae party you are going to need to have a variety of toppings. Here are 20 topping ideas that are fun for kids to put on their ice cream. Back to Kids Cooking Party from Sundae kids cooking party.